A hidden gem is a sacred place. Whether it be a bar, restaurant, rooftop, etc -- locating, frequenting and introducing others to your own little "spot" is one of life's greatest treats. It's like revealing a part of your self, akin to showing a page from a journal or sending a playlist to someone special. In this edition, eleven San Diego movers and shakers give us some insight on what little weird parts of San Diego they claim as their own. Like always, read through, learn a little and check 'em out -- but above all else, just don't burn them out. It's your duty as a local. "Every week with my friends I visit a spot called Hinotez off of Balboa Ave in Kearny Mesa. They have an insane variety of authentic Japanese cuisine: ramen, curry, sushi, sashimi, and the more traditional fare like natto (fermented soybean), grilled mackerel and yakitori (charcoal grilled skewers). Hinotez is unusually affordable and open as late as 1am every day. Be careful though... the drink menu is dangerous. Serving Sapporo, Asahi, and even Orion (super refreshing beer from Okinawa) on tap and sporting a mix of creative cocktails, sake, and shochu can wet the palette for consumption of half the menu, which runs up a heavy tab. Bar seating encourages social eating and the intimate booths and tatami areas accommodate a loud night with your pals before or after your evening activity. The staff is friendly and the decor is quaint. Check out Hinotez. Chances are you'll see any member of L.E.V any given time of the week." A view of Tijuana from San Diego at night. - Bryan Romero, Designer / Photographer, The Travelers Club. “If I told you there was a drink in San Diego that has been described as “the ancient nectar of the gods,” has been mentioned in the Bible, the Upanishads, and has been drank by legendary wizards like Gandalf and Dumbledore, it would be a really stupid decision not to try it… Unless you’re allergic to honey, I guess. This magical drink is called mead, the most ancient alcoholic beverage recorded in human history. I’ve had my fair share and no mead even comes close to Golden Coast Mead. Lucky for all of us, they have a cozy little tasting room in Oceanside. It has an acquired taste, like most alcohol, but once I got it, I really got it. It’s made purely from fermented honey and they say it’s like drinking sunshine in a glass. - Alan Lili, Founder / Host, Cura Caos. [Extremely Fort Minor Voice] 10% Cheese, 20% Meat, 15% Oil and Other Kinds of Grease / 5% Mayo, 50% Grain, 100% reason to remember the name. - Josh Lane, Singer, Songwriter, Musician, Josh Lane and the Heartfelt. "Not many people talk about it, but the Banzai Bar on Midway is a dope little skater bar with a solid beer selection. Monday’s are $3 you call it’s, plus they got two solid cooks with a late night menu that’s also vegan friendly. And you can roll up and smoke weed on the patio while you enjoy your beverage and solid bar food." "One of my favorite hidden gems would be the On A Sunday Afternoon event series at El Camino by Chulita Vinyl Club’s San Diego chapter. There isn’t too many places around here that you can kick back and enjoy some drinks and food while listening to some funk and soul. My favorite thing about Chulita Vinyl Club is that they’re all talented women who DJ spinning [vinyl] records. They have a variety of events playing different types of music around the city, but definitely check this one out if you’re into soul and funk." - Jonathan Rodriguez, Photographer, 3192 (✝). - Malik Burgers, Rapper / Musician, 1207, Lick Mob. “For the most part, central San Diego is comprised of urban development, business and residential neighborhoods, and canyons that stretch onto pieces of land that aren’t prime real estate yet. That’s why any tucked away oasis we find in this city we hold dear and visit as if each trip was a ritual. The harder to find, the more mystic. That’s how Chollas Lake feels. Much like most of City Heights and surrounding areas east, the lake’s reputation precedes it's charm. Nestled between the 94 and University Ave off College Grove, walking into Chollas park feels absolutely foreign after having just passed a Walmart, Chuck E. Cheese and 24 Hour Fitness. With a three-quarter mile long trail surrounding it, the manmade lake is hidden under a crown of trees, rocks and piers, though big enough to take you by surprise each time. - Andy Internets, Doer of Stuff and Things, The Travelers Club. "I personally love to go sesh and eat after. One place I enjoy to visit for a nice view and a chill environment is the J St. Marina in Chula Vista, it has so many little spots you can explore that feels just for you, with views like looking at the Coronado Bridge and the San Diego skyline. Then afterwards, I’ll go down to IB Street Tacos in, of course, Imperial Beach. IB Street Tacos is a small little place, you can eat inside if there’s space and there’s some tables outside. The tacos are amazing and well, to be honest, as a San Diego native and a person who crosses the Tijuana Border daily, I know good tacos. There’s no place like IB Street Tacos if you're in San Diego. They have carne asada tacos, amazing fish tacos, even octopus tacos, and the best part is that it’s not even that expensive. I’ll spend about ten to fifteen bucks on a meal and feel completely satisfied." - Crystal Lynn Bascon, Visual Artist / Model. 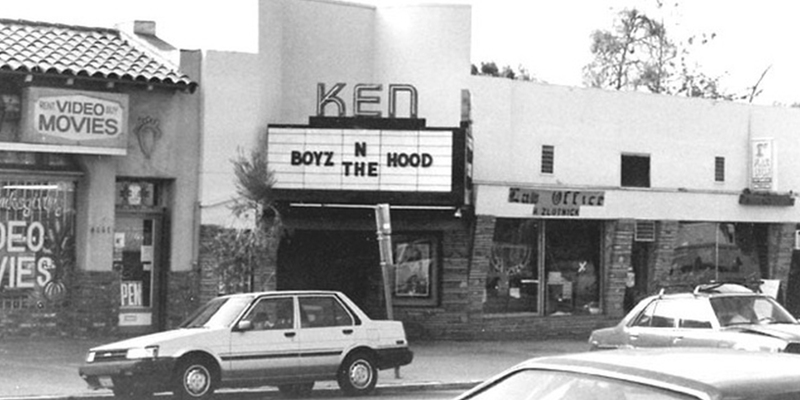 “It’s going to come across as very biased and as a promotional ploy but I assure you that I am not being sponsored when I say that the Ken Cinema is one of my favorite overlooked places in San Diego. I consider it a gem hidden in plain sight; people know of it and, don’t get me wrong, it has its share of proud regulars who have been frequenting the theater for upwards of decades, but, depending on the film that’s showing, we end many of our shifts screening the last film of the day to one or two. That’s really pathetic for an auditorium that seats nearly 400. It’s scary to think about the fate of the mighty Ken while living in a cultural climate controlled by people that value profiting off the immediacy that streaming and home-viewing services provide. I don’t know what has to happen to get more people, especially younger generations, to care about places like the Ken that isn’t forced and gimmicky or a complete overhaul of its niche market. Honestly, I think it’s due in part to, and I hope I don’t get fired for saying this, abysmal advertising in tandem with the attraction of other social priorities. The cinema house opened its doors in the mid-40s, was bought by Landmark Theatres in the ‘80s, and was almost shuttered in 2014— because of property matters, not because of low attendance like the media and word of mouth led many to believe. The Ken doesn’t need a preface about its age. The building has a history so rich you can feel it the moment you step inside. Everyone should experience attending a Saturday midnight screening of a cult favorite with friends that you have to perpetually elbow to keep them awake; munching on popcorn while watching a rarely-screened-in-San Diego 1970s foreign artwank film; laughing at how small the bathroom stalls are; chatting under the marquee’s iconic neon; or wondering if that shadow flickering on the ceiling of the auditorium was a staff member in the projection booth or a specter. - Laurie Piña, Cartoonist / Jack of All Trades, Ken Cinema.